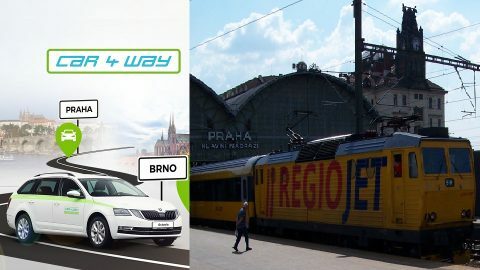 Czech open-access railway operator RegioJet in cooperation with Car4Way has launched a new service for passengers. The company’s customers travelling to/from Prague or Brno can continue their journey by renting a shared car. The passengers of RegioJet can use both ordinary and electric automobiles. To promote the service, discount prices are offered to the passengers of the RegioJet’s trains and buses. They have an opportunity to register on the Car4Way website or mobile application for just 1 Koruna instead of 1 thousand Korunas as a standard price. Also, the RegioJet customers receive 60 minutes free driving. They can use the option after purchasing a ticket for the RegioJet train or bus with a start or final stop in Prague or Brno. Car4Way operates around 700 cars. This number will increase to 1,000 vehicles by the year’s end. RegioJet is not the first rail operator in Czechia to offer its passengers a carsharing service. Another open-access company Leo Express offered its customers a SmileCar sharing service. Last year, it was merged with HoppyGo, one of the largest car sharing companies in Czechia. The merged service can offer customers more than a thousand automobiles. The business of RegioJet is focused on train and bus services across Czechia and Slovakia. The company’s main train lines connect Prague with Brno, Ostrava, Bratislava, Košice and Vienna. The transport operator also provides numerous bus links in Czechia and Slovakia as well as from these countries to the neighbouring states. RegioJet combines its bus and train connections. Thus, the passengers can travel from Ukraine to Slovakia by bus and from Slovakia to Czechia by train.